Choose your favorite Kauai beaches. Our Kauai map reveals each magnificent stretch of sand and/or coastal area to experience on your Kauai vacation. From the world’s best secluded shores at Polihale, to sparkling sands touching the majestic Na Pali Coast at Ke`e, there are many places to explore near our Kauai resorts at Poipu Beach and Princeville. 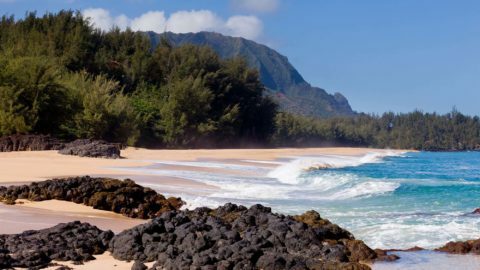 Click on any Kauai beach name to be swept away to our island paradise and see our favorite things to do on the splendid coastline of the oldest Hawaiian island. Anahola Beach makes for a perfect stop to or from our Princeville rentals. The surf conditions are excellent for swimming and Kauai snorkeling. 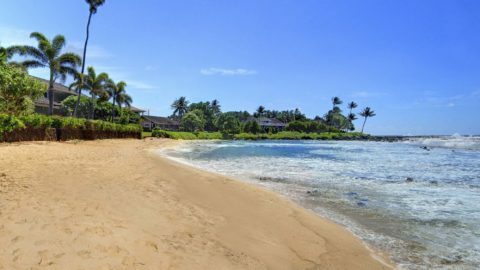 Frequented by locals, this white crescent Kauai beach offers something for all on the island’s east side. On this Kauai beach near Princeville Resort, you can snorkel the longest and widest reef in the Hawaiian islands and swim in safe, shallow water during summer. Anini Beach calls you with its dreamlike sparkling sand, colorful fish and beautiful turquoise waters. Watch the waves break at Brennecke Beach or stay nearby at our Kauai vacation rentals. If you are an experienced boogie boarder, this standout among Kauai beaches will not disappoint. Surf can get big here in summer so use caution when going out for the first time. One of the most spectacular Kauai beaches is Hanalei Bay with its iconic view of Bali Hai. This sweeping two mile crescent-shaped bay fronting our Hanalei rentals, has also been a favorite Hollywood movie location and was featured in The Descendants. 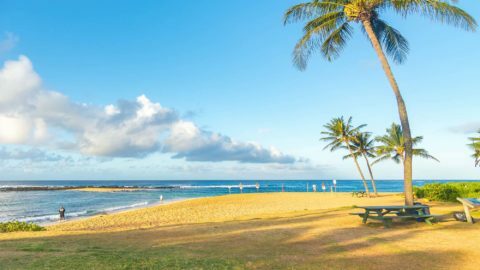 Take a peek into the history of this Kauai beach that lured the first major oceanfront Kauai resort to its shores. Our Kauai vacation rental guests make this their first or last beach stop near the airport. Located in Lihue and a top pick by Smithsonian Magazine. In the olden days this is where canoes stopped to get their bearings before making a beeline directly across the channel to Oahu. Now you can stop and enjoy many Kauai activities here at the park between our North and South Shore Kauai vacation rentals. This awesome Kauai beach is next to Kuhio Highway enroute from the airport to our Kauai vacation rentals at Princeville Resort. 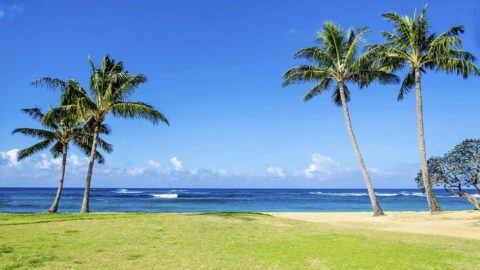 Plan a Kauai family-style picnic at Kealia Beach, enjoy ocean sports and walk the coastal Kauai Path along its half-mile stretch of white sand. Just a short distance from Koloa Town, and our Kauai vacation rentals near Lawai Beach, is this little inlet and small strip of sand known at Keiki Cove. Its shallow waters and typically gentle lapping waves are perfect for the little ones to learn about the ocean. The sun always shines at Kekaha Beach and the Kauai sunsets here are magnificent. Our Kauai vacation rental guests come for the wide sand beach and fewer crowds. The sea sparkles and the land flattens wide and long at this hidden gem. One of the most popular Kauai beaches on the South Shore fronts many of our Kauai vacation rentals. Locals call it Kiahuna Beach and visitors know it as Sheraton. Whatever the name, no Kauai vacation is complete without a visit to this wonderful white sand beach. 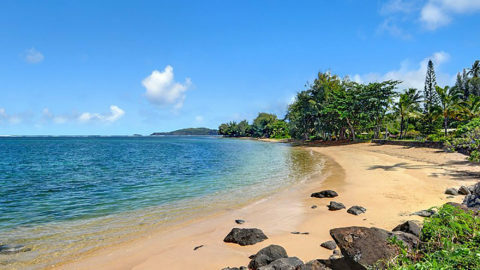 Plan a perfect Kauai beach day at Kukui`ula Bay. 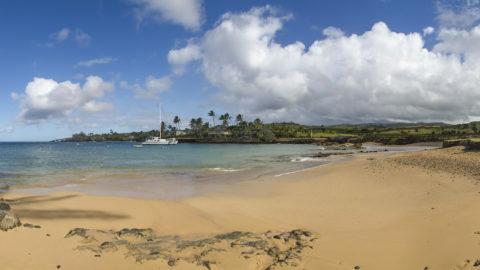 There are many Kauai activities to enjoy at its quaint harbor near Poipu Beach. Watch the Kauai sunset from here or at our Kauai vacation rentals nearby. For many Kauai vacation rental guests, this long stretch of sand offers a picturesque seascape on the North Shore. Hawaiians have come here for generations to harvest seaweed. Read our Kauai beach guide to discover more about Larsen’s Beach and its Swedish connection. Here is a top pick for Kauai snorkeling and highly recommended to our Kauai vacation rental guests. 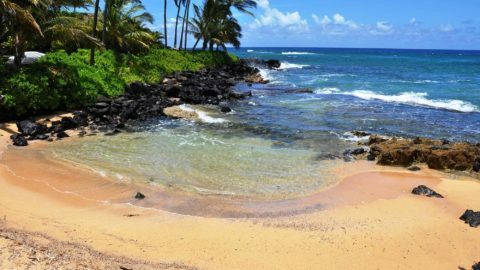 While the strip of sand is narrow on this Kauai beach especially during high tide, the main attraction here is underwater with the colorful fish you will see. Lydgate Beach has always been a place of Kauai family celebrations and Hawaiian culture. This Kauai beach has some of the easiest Kauai snorkeling. Two seawater pools include one for kids. Pack a picnic lunch at your Kauai vacation rental to enjoy at this park and playground. A short drive from Princeville Resort and our North Shore Kauai vacation rentals is the beautiful horseshoe shaped Moloa`a Beach. This peaceful Kauai beach where Gilligan once roamed, offers a multitude of Kauai activities to enjoy. Known locally for its beauty and its off the beaten track destination, Naue is located near Tunnels Beach and close to one of our newest Kauai vacation rentals in the Haena Collection. 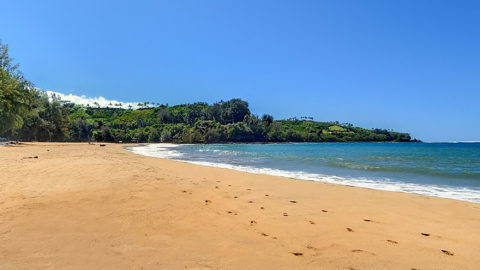 Just below Hanalei Bay Resort and a short walk from our Kauai vacation rentals there, are the two beaches of Pu`u Poa. These Kauai beaches also front the neighboring St. Regis Princeville. Exceptional views await you and a beautiful stretch of sand. Located near our Princeville Resort rentals, Queens Bath has a Jekyll and Hyde personality. While calm in summer it can be the complete opposite in winter. Read our Kauai beach guide to this popular Kauai activity. This gorgeous stretch of sand seldom seen by visitors is also called “Kahili” in Hawaiian. Located south of Kilauea town and near one of our newest Kauai vacation rentals “Hale Kai Kalani,” this is the place to go for an idyllic escape on the famous North Shore. 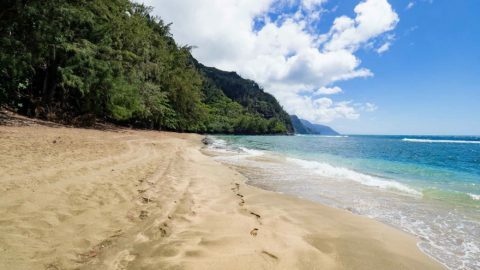 With its wide stretch of sand and secluded North Shore Kauai location, Secret Beach offers one of the most picturesque Kauai beaches to explore. Also nearby is the quaint community of Kilauea and its famous lighthouse. Tunnels Beach offers some of the best Kauai snorkeling. Stay at our nearby Haena Kauai vacation rentals and walk to this spectacular Kauai beach. Step onto Wailua Beach during your Kauai vacation rental stay and you are on a choice piece of land where the Polynesians first arrived and that Hawaiian Ali`i (royalty) later made their own. Native Hawaiians consider this area and Kauai beach to be one of the most sacred and culturally significant places in the islands. Four Kauai beaches in or around Waimea town offer a choice of Kauai activities and black sand beauty. This gateway community to Waimea Canyon also has unique places for our Kauai vacation rental guests to shop.